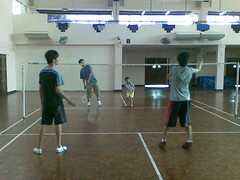 Didn’t really play badminton much this time round. Got hit by a really bad cough bug that knocked me out the whole day before. Joel’s friend joined us today. The youngest is getting a tad … bossy. His badminton skills though, have improved. This entry was posted on Sunday, January 13th, 2008 at 6:41 pm and is filed under personal rants, photoblog. You can follow any responses to this entry through the RSS 2.0 feed. You can leave a response, or trackback from your own site.